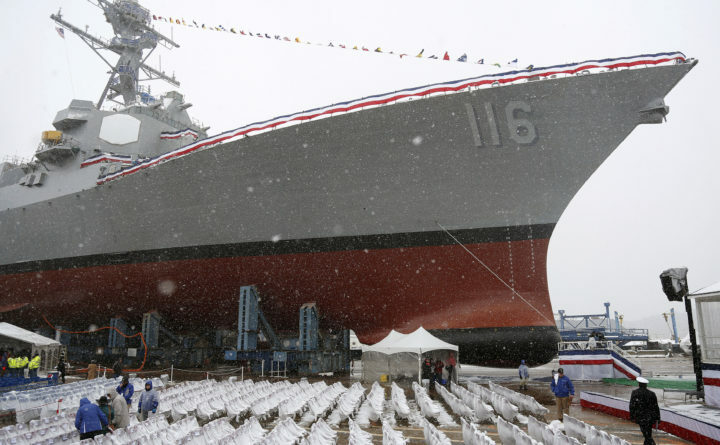 In this April 1, 2017 file photo, snow falls on the future USS Thomas Hudner, a U.S. Navy destroyer named after Korean War veteran Thomas Hudner, during christening ceremony at Bath Iron Works. The shipyard was awarded a contract to build another Arleigh Burke-class destroyer, according to a Friday night announcement. BATH, Maine — The U.S. Navy on Friday awarded Bath Iron Works a $911 million contract to build an additional Arleigh Burke-class destroyer. The award brings to five the number of DDG 51s awarded as part of a multiyear procurement announced in September. The Navy awarded $910,723,811 to build the DDG 132, with options that, if exercised, could bring the total to $921,990,345. The ship is expected to be completed by May 2026. At the time, BIW was awarded four destroyers, and competitor Huntington Ingalls Shipyard secured $5.1 billion in contracts to build six ships, marking the second consecutive multiyear procurement of Arleigh Burkes to initially favor Ingalls. In 2013, BIW came up short initially when the Navy awarded Ingalls five ships but BIW only four. But in 2014 the Department of Defense awarded the Maine shipyard a contract for a fifth ship. Each contract in the most recent multiyear award includes options for five additional ships in fiscal years 2018 through 2022. “The Navy held a separate competition for an option ship as part of its commitment to the growing fleet,” BIW said in a statement. The ship will be funded in the Fiscal Year 2019 budget. “Given the return of the focus on deepwater threats I wouldn’t be surprised if another ship wasn’t added at some point, again, to even it out. Again,” Jay Korman, senior Navy analyst with the Washington, D.C.-based consulting firm The Avascent Group, wrote in a September email. Only BIW and Ingalls, in Pascagoula, Mississippi, build Arleigh Burke-class destroyers, or DDG 51s, for the U.S. Navy. BIW currently has five Arleigh Burkes in various stages of production: the future Daniel Inouye (DDG 118), the future USS Carl M. Levin (DDG 120), the future USS John Basilone (DDG 122), the future USS Harvey C. Barnum Jr. (DDG 124) and the future USS Patrick Gallagher (DDG 127), for which Collins cut the first steel Nov. 9. The future USS Louis H. Wilson Jr. (DDG 126) is also under contract at BIW, but not yet under construction. Also under contract are four Flight III Arleigh Burkes awarded in September as part of the multiyear procurement. The final Zumwalt-class destroyer, the DDG 1002, which was launched Dec. 9, is also still under construction. BIW currently employs about 5,700 people.